The electrical service panel, commonly known these days as a breaker box, has come a long way since the early 1900s. 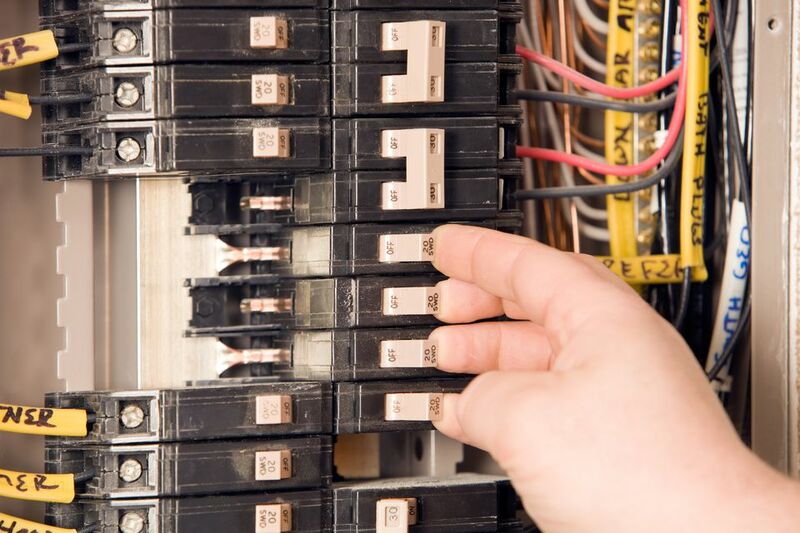 Almost every home has some type of service panel, whether it be a fuse panel or a circuit breaker panel. Commonly, these service panels are located in utility rooms, garages, or basements. Along with the main service panel, you may also have a subpanel, a small breaker box that supplies power to a specific area of your home, such as a garage or outbuilding or large home addition. Before 1950, a 30-amp fuse panel was the norm. These fuse panels featured two plug fuses to protect the branch circuits and a knife-blade switch to ​disconnect power to the entire panel, and thus the house. The fuses were installed in a ceramic fuse holder, which was mounted within a black metal enclosure. A 30-amp service panel typically supplied only 120 volts to the home. There was no 240-volt service for large appliances like electric ranges and dryers. A 30-amp panel is far from sufficient for powering the average household of today. Homes with these panels must be updated to at least a 100-amp circuit breaker panel to satisfy both the FHA and other lending institution requirements for home sales. Between 1950 and 1965, the 60-amp service panel became widely accepted and preferred. This panel was mounted inside a gray metal cabinet and featured a 240-volt feed. It had two cartridge-fuse blocks and four sockets for plug fuses. The first cartridge fuse block held 60-amp fuses and was used as the main disconnect. The other was used as an appliance feed and held a 30-amp fuse. It fed power to an electric dryer, water heater, range, or other high-demand electric appliance. The four plug fuses served four individual branch circuits. In smaller homes with minimal electrical needs, this was often sufficient to power the home. These panels did have their limitations, though, as they could not support more than one 240-volt feed or more than the four individual branch circuits. Some older homes have a 100-amp fuse box. This is similar to 60-amp box but typically has more capacity for serving additional branch circuits. Finally, in the 1960s, the circuit breaker panel came onto the scene and has remained the standard ever since. Circuit breakers represented a new age of resettable devices, unlike fuses that had to be replaced when they blew. The circuit breaker panel not only provides extra slots for adding circuit breakers, but it also includes both 120- and 240-volt circuits and a total amperage of 100 amps. This panel features the main breaker and two rows of circuit breakers that are used for branch circuits. There are many circuit breaker panels still around that have 100-amp service, but the standard for new homes (and old homes with updated wiring) is 200 amps. In fact, 100-amp panels are the minimum allowed. Newer panels with 200-amp service also tend to have more spaces for adding breakers. If you're planning a new home or a remodel that involves significant electrical work, a 200-amp panel usually is a no-brainer.